A post or two ago I gave some guidance on how to recognise Dry Rot, without sight of Dry Rot’s very specific fruiting body. Since then I’ve been asked to go a little deeper on rots in construction timbers. This post will enable you to quickly tell a white rot from a brown rot. Don’t worry, I’m not going to list umpteen Latin names and bamboozle you. There are plenty of books on the subject which do this. What I want to do is simplify rot identification and provide you with some basic knowledge you need. First of all, bear in mind that these rots are fungi. The food is the wood and the agent is the fungus. All that’s needed to get decay going is air and water. Dry wood doesn’t rot. Timber is incredibly durable with only moisture and fire being a real threat. By dry, I mean wood with a moisture content of less than 20%. Some use 20% as a marker of decay starting but really, fungus needs a bit more moisture to really thrive and develop. Dry Rot likes a moisture content of 27% plus and Wet Rot won’t really get going without a moisture content much less than 23%. Decay will ‘survive’ in timber with a 20% moisture content, but that’s about all. In saying that, 20% WMC in construction timbers should still ring alarm bells; you’d want to know why such a high MC% is present and whether it is drying, stable or increasing. So with the timber in moist condition, fungal spores will germinate and rot will develop. In nature; woodlands and such, most rots are in the ‘White Rot’ category. Whilst in building timbers, most are in the Brown category. This is because most White rots like a very high moisture content, which is not normally maintained in houses very well. External joinery, very wet cellars or flooded sub-floor voids are required for these White Rots to thrive (there are exceptions; I’m generalising). 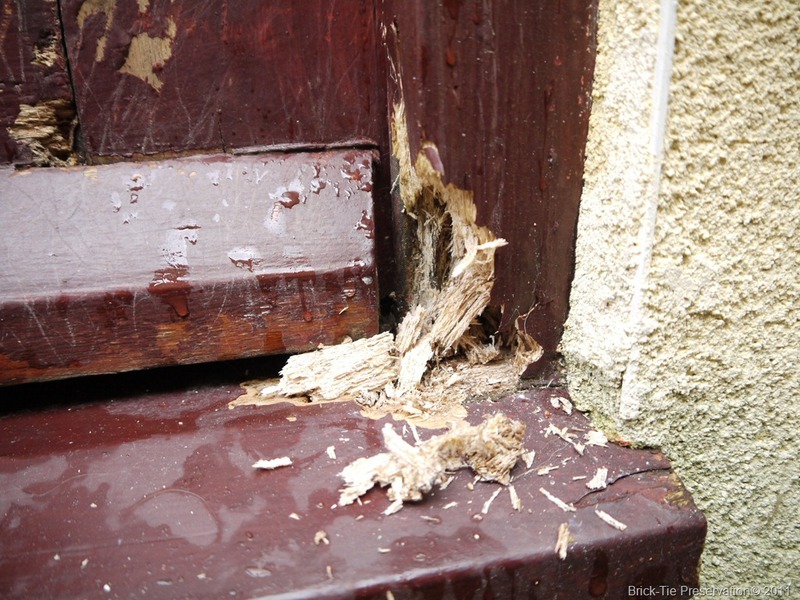 Here’s an image of the foot of an external doorframe attacked by a White Rot. White rots leave the decayed wood with a pale or colourless appearance. Brown rots may turn the wood brown, though it may not be too many shades darker than normal, depending on the species of timber. The Brown rots include The True Dry Rot fungus. 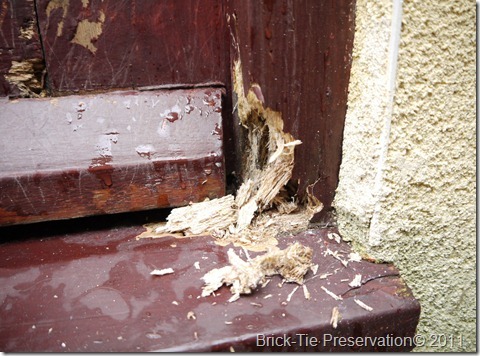 So if you see white rot damage, that’s a good way of ruling out Dry Rot. There’s only one Dry Rot and it’s a brown one. The reason for the colour change is the way these fungi feed off the wood. Brown rots can’t really metabolise the lignin in wood and their enzymes break down the cellulose and sometimes the hemicellulose. With the pale coloured sugars removed, the darker brown lignin and released lignin products remain, so the wood turns brown. I hope you have found this useful. Please feel free to ask if you need any further clarification.